Kitemaking 101, or "How I Learned to Make a Kite out of Dum-Dum Wrappers"
To figure out the spreading rates of various places in the seafloor, scientists compare the ages of rock samples taken from those places. It is not easy to figure out how old a rock is. They do not have growth rings like a tree nor do they have bruises caused by their aunt Barbara pinching them to grow an inch every time they have a birthday. Igneous rocks, like the basalt and gabbro in the ocean crust, do have something that can tell scientists how many years it has been since they formed, though. And, the coolest thing, these metaphoric clocks within the rocks are radioactive. Like everything, including the computer you are looking at and your elbow, rocks are made up of incredibly tiny particles called elements. 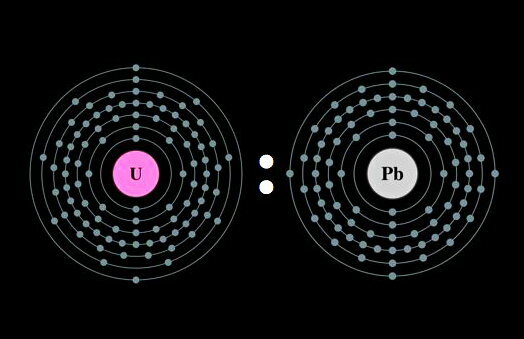 Most elements stay the same way for billions of years, but some, like uranium and potassium, are unstable and will change into other elements over time. For example, the radioactive isotopes of uranium continuously turn into lead. These unstable elements are called radioactive isotopes. One reason we know radioactive isotopes change into other elements over time is because very patient scientists have been able to observe this transformation take place in their laboratories. These radioactive isotopes change at the exact same speed over their entire lives. Scientists call this rate a half-life. A half-life is how long it takes half a radioactive isotope to change into another element. For example, the radioactive isotope uranium-238 has a half-life of 4.47 billion years. So what that means is if you had ten pounds of uranium-238 and you waited around 4.47 billion years (you might want to bring a magazine with you to pass the time), then five pounds of it would have changed into lead-206 (uranium-238 always turns into lead-206). Because it takes uranium-238 so long to change to lead-206, and because some rocks have been found to be billions of years old, looking for and counting uranium-238 and lead-206 atoms is a very useful way to age rocks. To give you a very simplified idea of how this works, lets say that chocolate chips are radioactive isotopes that turn into peanut butter chips. Let’s also say they have a half-life of ten years. Knowing this, you find a box marked “chocolate chip cookies” and you want to figure out how long ago the cookies were baked. You pull out a cookie and count the chips and find it has five chocolate chips and five peanut butter chips. Since half the total chips are chocolate and half are peanut butter, that means it must have gone through one half-life and must be ten years old (because, it was originally baked with all chocolate chips and it would take ten years for half of the chocolate chips to turn into peanut butter chips). To make sure there was not something weird about that particular cookie, you check other cookies in the box to see if they all produce the same age for the cookies. Another cookie has 12 chips, six of which are chocolate and the other six are peanut butter. Another cookie has eight chips, four of which are chocolate and the other four are peanut butter. Since all the cookies had half chocolate chips and half peanut butter chips, the box of cookies must be ten years old and I would recommend not eating those cookies. You do not have to have exactly half of the parent element (which in these cases would be uranium-238 or chocolate chips) and half of the daughter element (lead-206 and peanut butter chips, respectively (I wrote “respectively” just on the off chance you assumed that uranium-238 decays into peanut butter chips)) to determine how old a rock is. Any ratio of uranium-238 to lead-206 would allow scientists to figure out the age of the rocks. So if scientists measure the total amount of uranium-238 and lead-206 in a rock crystal, and 23% of it was the lead and the other 77% was the uranium, then scientists can plug these numbers into a formula to figure out the age when that rock first solidified. Since there is a lot more uranium than lead in this example sample, that rock would be a lot younger than the 4.47 billion year half-life (the scientists would be able to determine the age more exactly than a blogfish can). So how do scientists find and measure these isotopes in rocks? It involves crystals called zircons and laboratory instruments called mass spectrometers. To find out more about this process, you should read my next blog post.